Paul Halter is a French author who has gotten considerable praise, with comparisons left and right telling you he’s the reincarnation of John Dickson Carr. However, the modern American mystery market is flooded with the kind of modern mysteries that I hate— emphasis is no longer laid on the story, but on “literary” elements of writing (which often aren’t that hot to begin with). I’ve given this rant many times already, so I’ll spare you having to listen to the whole thing again. 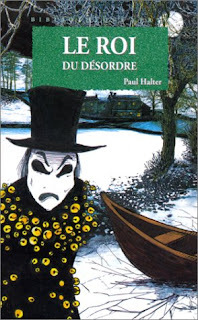 Paul Halter, who unashamedly clings on to Golden Age ideals, has found it rather difficult to get his books published in the English-speaking world, despite rave reviews for the translated La Nuit du Loup (Night of the Wolf). 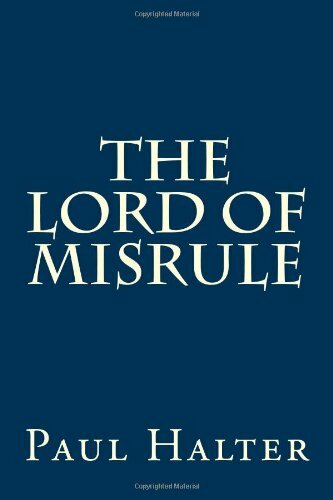 Therefore, John Pugmire, a relentless soldier in the cause to get Halter translated and published in English, decided to publish Le Roi du Désordre (The Lord of Misrule) himself. However, understanding French rather well myself, I read Le Roi du Désordre in its original French. This was my first full-length Halter novel, and it’s a good one. 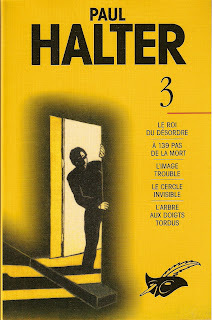 While far from perfect, it is a good showcase of Halter’s strengths and weaknesses, and it has made me a Halter fan. The story is told by Achille Stock, who is walking in London when he encounters, quite by chance, Owen Burns, who is busily trying to explain to a flower vendor that he wishes to buy all of the flowers except the one he has in his hand. He then hails a cab and demands the driver takes him to Gray’s, while the poor cabdriver looks helplessly at the other side of the road and points out that he’s already there. This doesn’t stop Owen, who climbs in, and with a look of indignant grandeur that would make Sir Henry Merrivale jealous, arrives at Gray’s after the cab driver goes down the road, then turns around to come right back. This opening scene hooked me, as Owen Burns reminded me of Sir Henry Merrivale, one of my personal favourite sleuths. Burns was, apparently, modelled after Oscar Wilde, and he’s the most interesting character of the entire book, with an obsession for art and beauty. At any rate, revenons à nos moutons… Achille puts the extraordinary encounter out of his mind, but he bumps into Burns later that day, and Owen Burns immediately recognizes a fellow artist in Achille Stock. Later, Achille runs into a young lady, who seems to be terrified at the sight of him, running away from him. He gives chase and catches up to her, hearing her murmur words that suspiciously sound like “Lord”, “misrule”, and “I thought it was him”. As it turns out, Sybil, Mansfield’s elder daughter, is the woman Achille encountered a year ago in the streets of London, and he finds himself attracted to her as they both remember their first meeting. Unfortunately, she is engaged to marry Piggott, leaving Achille with a conundrum: he is in love with one woman, but must pretend he loves another. Achille learns in the meantime that, a few years ago, Sybil’s half-brother Edwin was murdered under impossible circumstances in his room—a figure was seen entering the room, but nobody left it. There were no footprints in the snow surrounding the only available exit. And yet, there was a struggle, and Edwin was discovered stabbed, murmuring words that sounded suspiciously like “Lord” and “Misrule” before expiring. 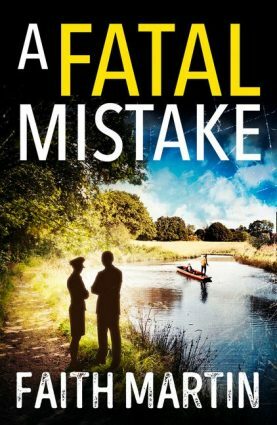 Before long, a second murder occurs under just as impossible circumstances, when a man is out of sight of witnesses for a mere minute, after which he’s found stabbed—with no footprints anywhere in the snow near the body!!! It seems that the Lord of Misrule has struck again!!! Who is this titular Lord of Misrule? Well, it’s a fascinating English custom, but more important than that, this Lord of Misrule seems to be the ghost of Peter Joke, who died centuries ago as the result of some games that went out of hand. He broke through the ice on a lake near the Mansfield’s house, and drowned, with those who were present being unusually silent about what led to his death. For a few years afterwards, at Christmastime, one of those people were found dead, with witnesses usually claiming they saw someone wearing Joke’s costume: a white mask and a costume with bells attached to it, tinkling at every step... It is an effectively creepy ghost story, which genuinely made me shiver. Unfortunately, the same can’t be said for everything in the book. There are several séances, for instance, but they strike me as a marvellous missed opportunity. They never manage to attain the eeriness of the ghost story. In addition, I was somewhat puzzled that the servants, Nicholas and Mary, were invited to partake in the séance. While they are close to the family, they are, after all, servants, and wouldn’t the family be reluctant to reveal the skeletons hidden inside their closet? And there we move towards another flaw in Halter: his portrayal of England. It isn’t particularly atmospheric, though, as a Canadian, I appreciated the descriptions of a snow-covered countryside. (What? I love snow!) Still, Halter’s picture of England is a romantic misconstruction—while Halter strikes me as a genuine anglophile, his vision of England is of a place that never really was, rather like John Dickson Carr’s idealised pre-WW2 England. But at the same time, Halter doesn’t focus on setting. He doesn’t even give the mansion or nearby village a name (unless I missed that somehow). Therefore, I dub them Doom-and-Gloom Manor and the village of How ‘bout some tea? Truly, he missed some opportunities— setting can be just as important to atmosphere as story and characters. Ah, characters. Paul Halter’s characters are far from memorable. In fact, apart from Owen Burns, there’s nobody really to remember in the novel except, maybe, Achille Stock. Maybe Daphne as well. Sybil, on the other hand, spends the entire book being either melancholy or weeping. Then again, when Halter gives his characters names like Stock and Joke, that should be a clue about how important characterisation is for him. No, Halter’s strength is in the plotting, but there’s weaknesses in that, too. Halter tends to work up towards a potentially emotional scene, but then, he reaches the end of a chapter and cuts away from the scene, looking at it instead in retrospect. The worst example is when Achille and Sybil are alone in a room together, and Achille is tempted to kiss her. Enter the jealous fiancé, Samuel Piggott. End of chapter. And just like that, you’ll almost never hear of the scene again. What happened? A strained confrontation? A warning of “don’t you touch her, m’boy”? You’ll find out once in passing, and the only clue that the scene ever happened is that Samuel Piggott doesn’t really like Achille. That was a huge opportunity for creating tension gone, gone with the wind. In addition, some psychology at the end to explain a character’s actions sounded to me like bunkum, but at the same time, this bizarre psychology had its rules set early on. I really don’t want to explain in more detail than that. All this may sound like I hated the novel, but I emphasize that I actually loved it. Its wonderful ghost story really caught my imagination, and its two impossible crimes are brilliant, with simple solutions that left me kicking myself (particularly for the second murder). I would’ve liked some stronger clues, but I can’t honestly say I felt cheated—and that itself, in the modern mystery landscape, is an achievement. Halter reminded me just why I love mysteries— he is almost exclusively plot-driven, and to tell the truth, with such a good plot idea, that’s a good thing in many ways. So is Halter the second coming of John Dickson Carr? I don’t think so. Good old Carr would show this French author a trick or two about atmosphere, setting, and probably even character. But I’m sure Carr would be very pleased with the plot itself, and the ghost story attached. I loved the idea, and Halter captivated me from start to finish, keeping me up until 2 AM, eagerly wanting to find out what happens next. And really, what more can you ask from an author? Everything I had to say about this book was already said on the Golden Age Detection Group, but to summarize it in a neat sound bite: Paul Halter is a very problematic author whose imagination is intriguing, but his inability to properly clue, tell a story and lacking any sense of time and place makes you, at times, want to chuck the book back in his face. During the GAD era, he would've been a second-stringer at best. While I can see why you would say this, I will reserve full judgement until I read more of Halter (though this book has me inclined to view him in a positive light). I've got eight more books sitting at home, and among them are apparently some of his best plots. 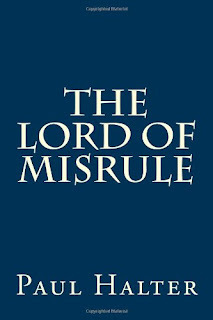 "The Lord of Misrule"/"Le Roi du Desordre" is quite definitely a mixed bag, but I have to disagree about him being a second-stringer during the GAD era. As for proper clueing, it's debatable. I didn't feel cheated, but it could've used stronger clueing. I remembered everything he called my attention back to- it borders on "green tie" territory, but it doesn't quite get there.